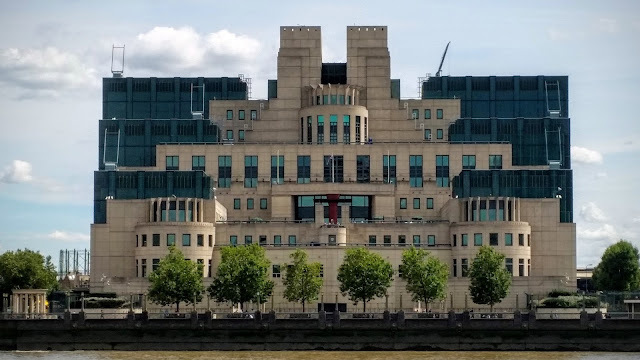 The building became home for the Secret Intelligence Service in 1994, as there old headquarters were deemed unsuitable and insecure, with the volatile climate of the time. The architect, Terry Farrell, based his design on 'industrial modernist' with a hint of the architecture used by the Mayan and Aztec, in the building of their temples. The building has a total of 60 separate roof spaces and there are three different types of glass used in the construction, much of which is triple glazed. Because of the nature of the work carried out by the SIS, many of the floors are hidden below street level. As well as the offices, corridors and other secure areas there is also an aerobics studio, gymnasium, squash court and a restaurant for the staff to use. There is also a rumour that a tunnel links the building with Whitehall, but it is only a rumour.